East Boston News (Eastbostondot.com) received this latest dispatch from Fr. Mike Mendl in New Rochelle today. A five-truck convoy arrived today in Port-au-Prince from La Vega for distribution in Pétion-Ville and Carrefour-Thorland. Commodities included food stuffs (2 trucks), potable water (2 trucks), and medications and clothing (1). All relief items were purchased in the Dominican Republic. The 300,000 chlorine tablets reported on earlier were delivered in Port-au-Prince on the evening of Jan. 25. The drinking water unit – AquaCube – (acquired through BEGECA) arrived in Santo Domingo and is being trucked to Port-au-Prince with logistical support and transport provided by the UN. Fr. Jacques Charles, outgoing Haitian SDB provincial, will pick up the drinking water plant from a warehouse contiguous to the German embassy in Port-au-Prince on Jan. 27. BEGECA’s representative in Santo Domingo, Gunter Timmermanns, will be working out of the SDB Antilles provincial house and is coordinating SDBs UN-led logistical support. Fr. Stra has been released from the hospital and is recovering and resting well at the SDB Antilles provincial house. Hendrix Pineda from Salesian Missions New Rochelle has arrived in Santo Domingo to (a) provide communications support to Fr. Mark and (b) set up financial accountability systems and records for reporting to donors and benefactors who are contributing to the Haitian Emergency Relief and Reconstruction Program efforts. 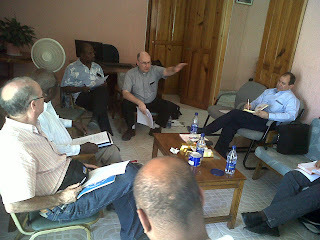 The new SDB Haitian provincial, Fr. Ducange Sylvain, will be installed on Saturday, Jan. 30, in Port-au-Prince. Planning to attend are Fr. Esteban Ortiz, SDB, general councilor for the InterAmerica Region; Fr. Victor Pichardo, SDB, Antilles provincial; Fr. Mark Hyde, director of Salesian Missions in New Rochelle; and many confreres from the Antilles Province as well as members of the Salesian Family attending the CIEC (Conference of InterAmerica Catholic School Educators) meetings in Santo Domingo at this time. Gianluca Antonelli reports that VIS has met with Civil Defense experts from the Italian government (Guido Bertolaso and Agostino Miozzo) who, together with Italy’s ambassador to the D.R., visited ENAM. Mr. Antonelli reports also that an Italian Navy ship will dock in Haiti on Feb. 2. The ship is equipped with a hospital and also has a contingent of 200 military experts on infrastructure and buildings with equipment of various kinds. The Navy is reported to be offering the Salesians in Haiti availability for: (a) removing debris from Salesian properties, (b) checking to verify the safety and usefulness of the Salesian infrastructure, (c) securing damaged buildings, and (d) assisting with displaced populations staying on Salesian property. Jugend Eine Welt (Austrian Salesian NGO) in partnership with CARITAS Austria is seeking funds from the EU for a 6-month project aimed at providing emergency support for 20,000 youths associated with the “mini schools” at Cité Soleil and La Saline. From the Netherlands: Parents and children of a European School in Bergen (13 miles north of Amsterdam), are raising funds to help the SDBs of Haiti rebuild some of the mini schools. School and students are said to be aiming at raising around 8,000 euros. They are also (a) collecting French and English books to send to Haiti’s SDBs and (b) putting together “shoeboxes” filled with school supplies and small toys for the children. The SDBs of Haiti have requested 2,000 tents with capacity of 6 people each. Salesian Missions is making arrangements to procure and meet this urgent need. Likewise, if any of the other Salesian procures or NGOs have access and can airlift those to Santo Domingo, please contact Fr. Mark at FrMark@salesianmissions.org with copy to Jaime Correa at jaimec@salesianmissions.org. One forklift to offload pallets of food and emergency relief items from containers at the Jimani, D.R., repacking center is being purchased in Santo Domingo. 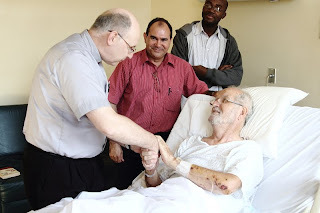 How to help the Salesians. Get vaccinated today against the H1N1 (swine flu) and regular seasonal flu at East Boston Neighborhood Health Center. Fr. Mark plans to communicate the results tomorrow. Fr. Mark visited Fr. Attilio Stra in the hospital in Santo Domingo. A photo of them with Fr. Pichardo and the Haitian brother who has accompanied Fr. Stra is attached. Gianluca Antonelli, executive director of International Volunteers for Development (VIS), has offered a part of the financial and technical support for an osmosis water purifying system with capacity to filter up to 7,000 liters of salty water per day. The technical support offered also includes a permanent internet connection via satellite by the provider Signis. VIS has had a photographer, Beatrice Giorgi, in Port-au-Prince for several days. Several of her photos have already appeared through ANS (the Salesians news agency at HQ in Rome). Unfortunately, the shots that do have captions are in Italian. They include several shots of the refugee camp set up at the Salesian school of Carrefour-Thorland; boys with report cards; Fr. Pierre Lephene, including one where he is “dissuading street kids from looting the school”; and removing rubble by hand. Don Bosco Prep of Ramsey, N.J. has engaged in an active publicity campaign with local media. An article on January 20 in northern New Jersey’s Record newspaper ("Don Bosco Prep mourns losses at Haitian school belonging to same Catholic order")” led to extensive coverage of Thursday's school Masses by The Record, Suburban News, 1010 WINS (biggest AM radio station in New York, with the largest number of listeners in the U.S.); Cablevision's News Channel 12 New Jersey; FOX Channel 5; WMBC-TV; NBC News. On January 22 Fr. Louis Molinelli, the school’s director, was interviewed about Haiti by WABC News and Verizon FIOS TV. Channel 12’s video: Since Wednesday afternoon (January 20), the alumni and parents of Don Bosco Prep have contributed nearly $15,000 to the Salesian relief efforts in Haiti. The school has received countless expressions of sympathy for the Salesians’ and their students’ losses in Haiti and. The alumni want the Salesians and the people of Haiti to know that they are in their prayers. Salesian Missions logistics personnel have received confirmation that the first three containers from Cross International are ready to be shipped. The port of arrival is yet to be determined, as the port of Barahona is not a designated international seaport. After Salesian Missions communicated with the UN Logistics Clusters, they confirmed the installation of a UN General Coordination Center in Barahona with distribution center in Jimani. It is probable that Fr. Mark will extend his stay in Santo Domingo for a few more days. In light of this, a local coordination meeting is being worked on to use UN transportation means as part of Salesian relief efforts. A bill has passed Congress to allow donations made to a U.S. charitable organization, such as Salesian Missions, for Haiti between January 12 and February 28 to be taken as tax deductions for 2009. The President is expected to sign the bill into law. Germany’s Misereor plans to send two architects to Port-au-Prince next month. Salesian Missions’ Web page (www.salesiansmissions.org) has been updated to include news and photos from Haiti and press releases that are readily accessible. News updates are posted daily at the New Rochelle Province Web site (www.salesians.org). NBC-MSNBC| “Cite Soleil's best and brightest buried in mission school” (Jan. 21) – appeared on MSNBC homepage (They filmed at ENAM – great piece. We are hoping the network will pick this up as a national feature). A couple of minor corrections of past news summaries: the Spanish Salesian NGO’s proper name is Jóvenes y Desarrollo. Salesian Missions has usually called the late Fr. Bohnen’s schools “Mini Schools” (just a variant translation of Petites Ecoles, of course). And a clarification: ENAM housed not only the main kitchen for the Fr. Bohnen Mini Schools but also their administrative offices. All that was wiped out. We’ve all been moved by the news and images coming from Haiti this week. Our thoughts and prayers are with the people of that nation, as well as their friends and relatives who are here in the United States. Greater Boston has, in fact, one of the largest Haitian communities in the country. There are a number of ways that each of us can take action to help our neighbors to the south. First, cases of bottled water will be accepted 24 hours a day from Jan. 18-23 at the Boston Harbor Shipyard Marina at the end of Marginal Street in East Boston. The water will be loaded onto a ship bound for Haiti that will set out on Jan. 24. Beyond sending clean drinking water, donating to organizations that are doing important work on the ground in Haiti is critical. You can quickly donate a small amount that will be added to your cell phone bill by sending a short text message to 90999. Texting “HAITI” to the number sends $10 to the American Red Cross, while texting “DOB” sends $5 to Doctors Without Borders. I’m proud of the response to this disaster that I’ve seen from the American people and the US government, and I want to thank you for all you’ve done personally. A ship will leave on January 24th out of Marginal Street shipyard next Sunday that will carry much-needed bottled water to Haiti. The ship which arrives monthly and carries "clunker" cars and trucks to Haiti will this time be filled with as much water as can go in the vehicles on the shipo. From now until next Sunday, the ship will be accepting bottled water Just contact the guard office on Marginal Street. The shipyard workers will pack the water on pallets. Many of the East Boston restaurants have already agreed to bring some water down to the ship yard. The shipyard manager will be releasing more information later. "Scott Brown has run an admirable race. He has been fair and honest and accessible. Martha Coakley's campaign has run a despicable race. They have distorted everything they can about Scott Brown's voting record. They have insulted Scott Brown's family and lifestyle. Worst of all they have labeled anyone that supports Scott Brown's effort to take back government as right wing extremists, radicals and liars. The Coakley campaign has made offensive statements about The Boston Red Sox, Catholics, and anyone that stands in the way of big government. Is that the change we were promised?" Martha Coakley never imagined in would be this close in the bluest of Blue States. Now she's fighting for her political life. In an indication of Coakley’s challenge, a couple of voters at her stop in Lynn said they planned to vote for Brown because they saw him as a change agent - a theme that has been a core message for Democrats in recent election cycles. How can this be? Never take anything for granted. Martha Coakley, may still yet pull this out and in large part not to her efforts. She has run the worst campaign in Massachusetts political history. As Michael Barone observed, “the educated class” was dazzled by style, the knuckledragging morons are talking about substance. They grasp that another year of 2,000-page trillion-dollar government-growing bills offers America only the certainty of decline. Just before the Senate’s health-care vote, Obama, the silver-tongued orator, declared that we were “on the precipice” of historic reform. Indeed. On Tuesday, we’ll find out whether even Massachusetts is willing to follow him off the cliff. Riding a wave of opposition to Democratic health-care reform, GOP upstart Scott Brown is leading in the U.S. Senate race, raising the odds of a historic upset that would reverberate all the way to the White House, a new poll shows. Although Brown’s 4-point lead over Democrat Martha Coakley is within the Suffolk University/7News survey’s margin of error, the underdog’s position at the top of the results stunned even pollster David Paleologos. Update from the Salesian Sisters in Haiti by way of Fr. Mike Mendl in New Rochelle. The message continues telling us that the sisters of the province are organizing collections of medicine, water, and necessary items to send a first container. They are also organizing the sending of other sisters and more help. All in Santo Domingo are mobilizing to assist the victims of this great tragedy. Just a short time ago a volunteer from the Bread Shared organization succeeded in contacting his son who lives in Haiti close to the sisters in Cité Militaire, Port-au-Prince. The young man was able to speak with Sr. Anna D’Angela, who assured him that the five FMA sisters of the community are all right. Then the communication was interrupted, and we still do not know anything about the house or the children who lived there. Rome (Italy). Mother Yvonne Reungoat is personally following the development of events from Haiti, especially for what regards the sisters and the communities. Despite the difficulty of a direct connection, a short time ago we had news of a telephone contact of Sr. Judith Jean-Baptiste, a Haitian sister student at the Auxilium in Rome, with her family living at Port-au-Prince and with the novice directress, Sr. Monise Rodney. We learn from the communication that sisters of our communities there have not suffered personal harm. The only sister who was initially taken to the hospital has been released. Furthermore, they tell us that the families of our sisters seem to be in good condition. From the telephone contact we have come to know that presently all the Haitian sisters are working full-time without interruption at the service of the people who have been most affected. They live under “open skies,” given the practical insecurity of our houses. We can further verify the logistical situation, but especially that of those who are sheltered in our houses: students, residents, teachers, and collaborators. As an Institute we have received many signs of solidarity at the various levels and we are mobilizing to coordinate help and to intervene directly with aid at the place. TOKYO — Former Boston Symphony Orchestra music director Seiji Ozawa says he has been diagnosed with esophageal cancer. Ozawa, an icon in the classical music world, said the cancer was spotted following a regular medical checkup late last year. "I am perfectly fine right now. I have no problems in drinking and eating," the 74-year-old maestro said at a news conference in Tokyo. A doctor who accompanied Ozawa at the news conference said the cancer is in an early stage. Ozawa will cancel all his concerts from January to June to undergo cancer treatment. His office said there are around 30 concerts at home and abroad scheduled during the six months. "EAST BOSTON, Mass., Jan. 5, 2010 (GLOBE NEWSWIRE) -- Meridian Interstate Bancorp, Inc. ('Meridian Interstate') (Nasdaq:EBSB), the holding company for East Boston Savings Bank, announced today that it has completed its acquisition of Mt. Washington Cooperative Bank ('Mt. Washington'). The combination of Mt. Washington and East Boston results in a community bank with 20 full service branch offices located throughout the Boston metropolitan area. Each Mt. Washington branch office has become a branch office of East Boston Savings Bank, and such branch offices will operate under the name 'Mt. Washington Bank, A Division of East Boston Savings Bank.'" Kevin Cullen of the Boston Globe on Bob Anthony's effort to recognize the supreme sacrifice of First Lieutenant Louis Edward Porrazzo, KIA in Vietnam. The skating rink that bears Porrazzo's name since the late 1960s was rededicated Saturday night before a high school hockey game. Along with other officials, Boston Mayor Tom Menino wants the feds to pay attention to LNG tankers from Yemen. Menino and several other public officials said they would press for the tankers’ cargo - destined for an LNG terminal in Everett as soon as next month - to instead be unloaded away from the city, in light of the failed Christmas Day attempt by a Nigerian man, who trained in Yemen, to blow up a US airliner over Detroit. House Speaker Robert A. DeLeo, who had called the plan to bring in the tankers “a matter of grave concern,’’ said yesterday he would contact the state’s top public safety official - Kevin M. Burke, the secretary of the Executive Office of Public Safety - to look for ways to halt the deliveries. The Globe reported yesterday that shipments of liquefied natural gas from Yemen are scheduled to arrive for the first time in Boston as early as February. Coast Guard officials are reviewing the plan and said yesterday they have not yet decided whether the shipments will be allowed to enter the harbor and dock at the LNG terminal in Everett. “Their paramount concern is the safety and security of the Port of Boston,’’ Coast Guard spokesman Jeff Hall said of the security team reviewing the plans. Concerns among Menino and other local officials have intensified since the failed plot last week, which renewed fears that Yemen has become a haven and training ground for extremists.